If you started it last time you will start from where you got to, if you completed it last time you won’t have to complete it again! 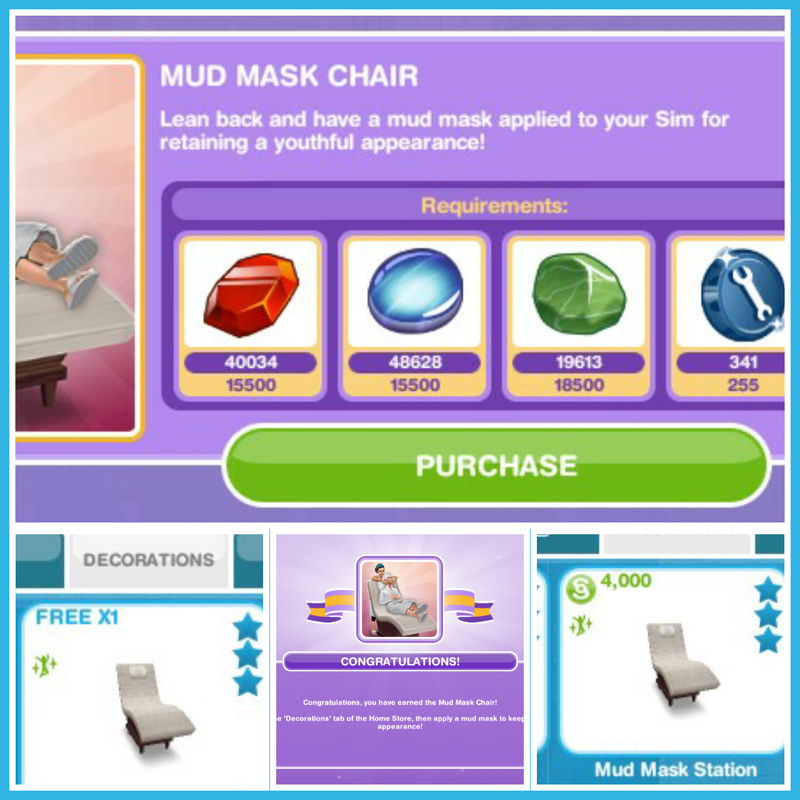 Here you will see you have collected enough items to unlock the Spa Robes pack! 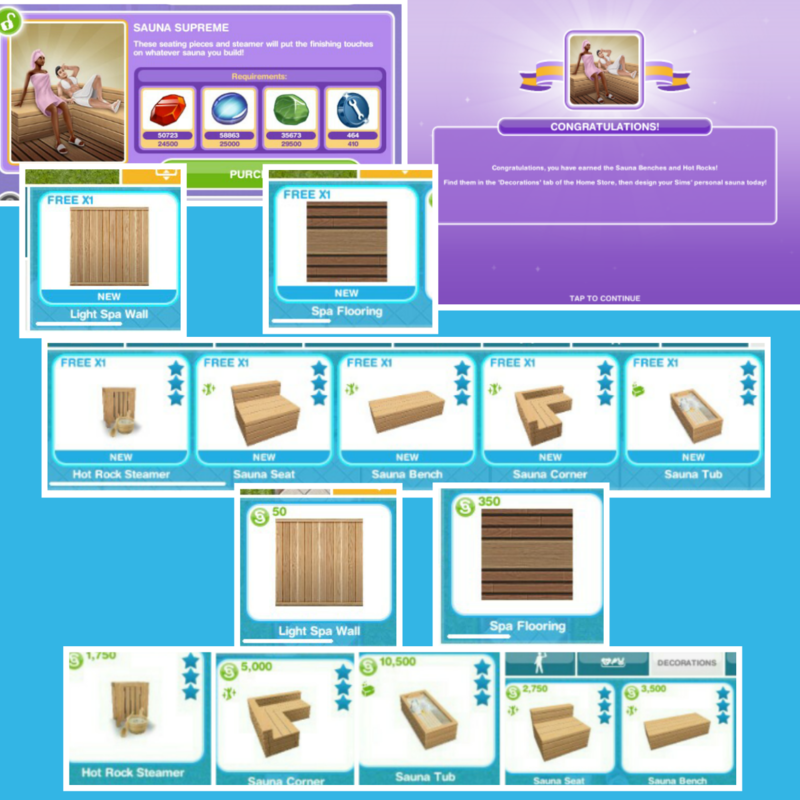 When you unlock each pack, before the items are available in your home store/wardrobe you need to purchase them with the arts and crafts items you make- this goal is coming up! NOTE: remember to click CLAIM once you have completed a daily goal to collect the reward and remember to claim your free constructor coins and free candles each day! 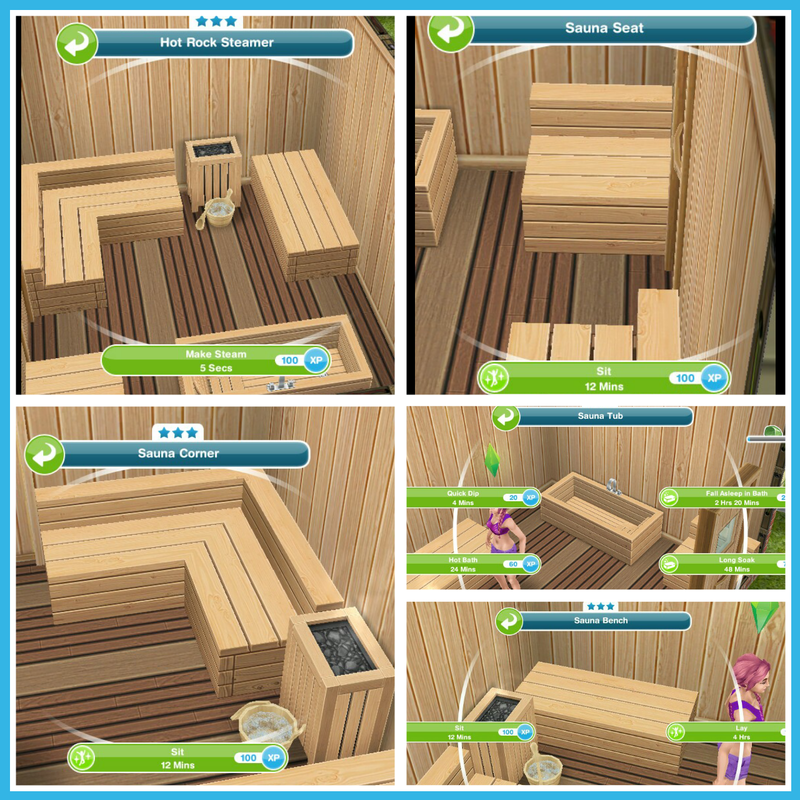 This pack contains spa wallpaper, spa flooring, sauna bench, corner and seat as well as a sauna tub and hot rock steamer to make your own sauna room! 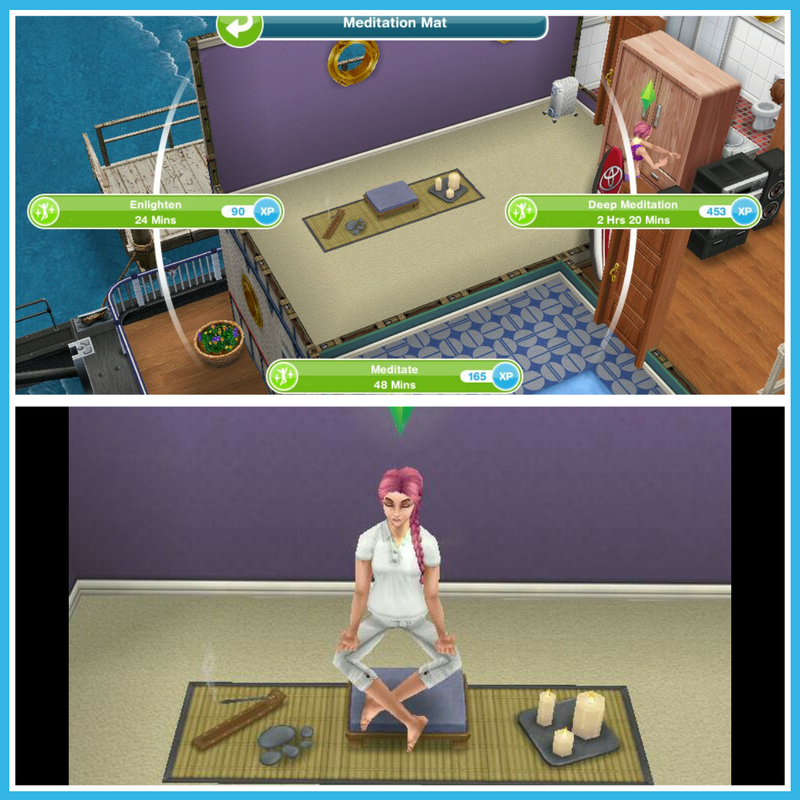 The hot rock steamer can be used to make steam and the seat and corner can be sat on, the bench can also be sat on and a sim can also lay on it. The tub has the same options as a normal bath but remember you will find it in the decorations section not bathroom section. 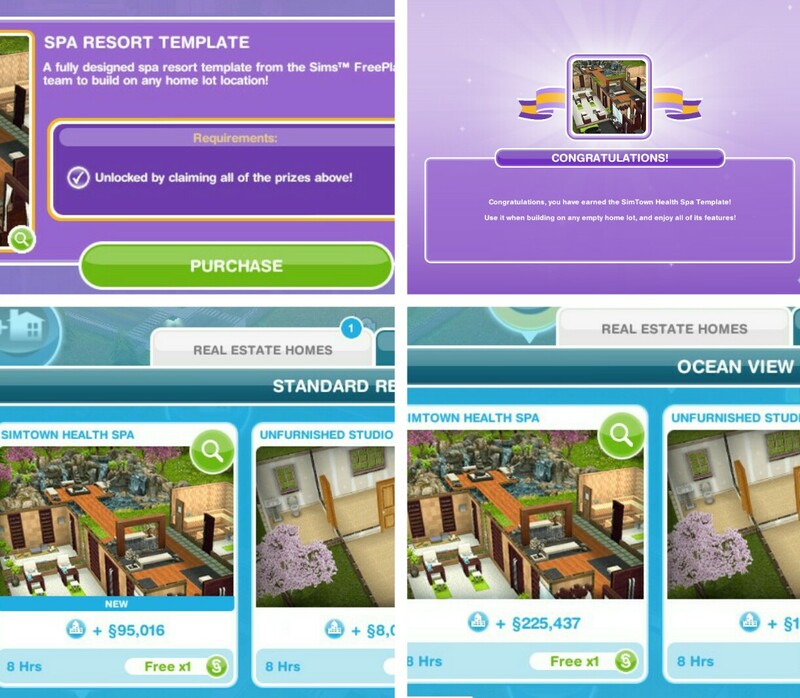 Hi, i want to ask you about Sims FreePlay, i haven’t played it yet, is it too late in your opinion if i begin to play it now? sorry if my grammar is bad. thank you. You’re very welcome and thank you! Good luck! 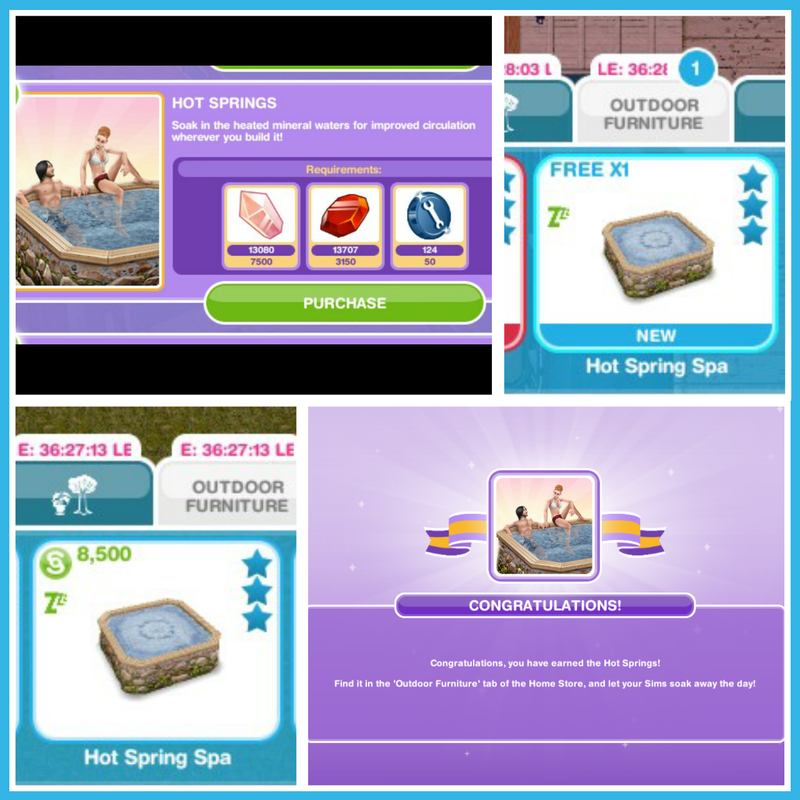 This is my first time doing the health spa event, but my progress tab did not start from the beginning. 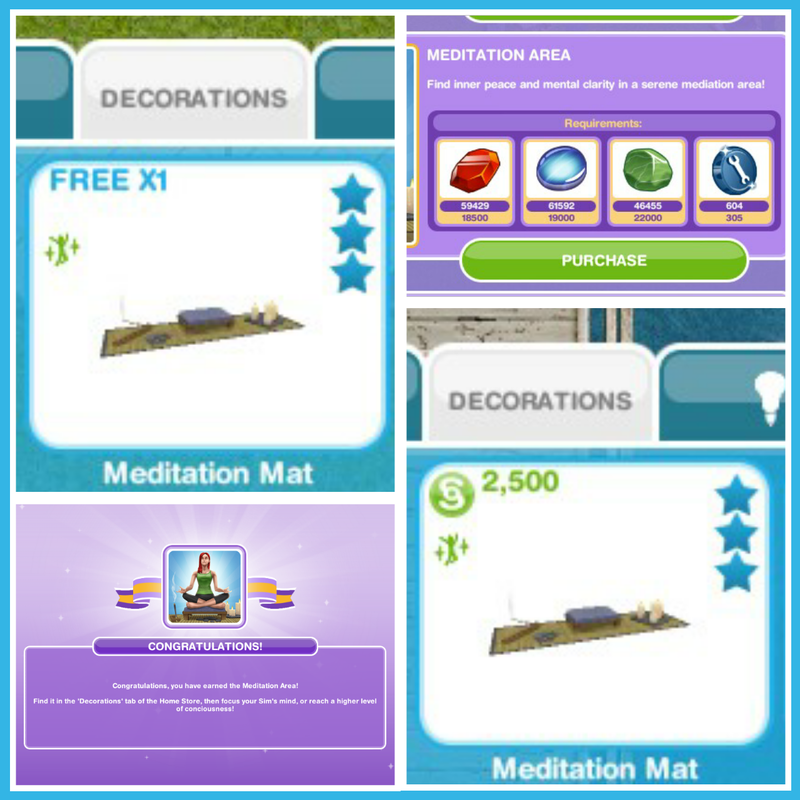 I won a meditation mat from a mystery box and it seems to have started me from there. I have all the stations unlocked, but i’ve missed all the coins leading up to that point. Do you think I’ll still be able to complete the event? Also, my friend won a foot spa from the mystery box and her’s started her from there on her progress bar, with the first three station types already unlocked. If you unlocked an item then the game assumes that you reached that point last time so this isn’t a glitch but it is hard to say if you can complete it without those coins, it really depends how lucky you are with the spin plant! Hi! Love your blog. I started this event the last time it was around I guess, since I seem to be about 75% through the prize track. I’m picking up at the point where I just unlocked the meditation area. I should have all the currency tables unlocked, but I’m not able to use them. I can only use the candles. When I click on the others it gives me the standard message “Unlocked by progressing through the current event. Check the prize progress tab of the event screen to see when the pottery station will unlock.” Since I’ve started this event in the past… I shouldn’t need to unlock the stations again, right? Or if I do, how do I go about unlocking them now? Appreciate any info/help you can suggest! I had the same problem! It’s really annoying and I thought I was the only one! 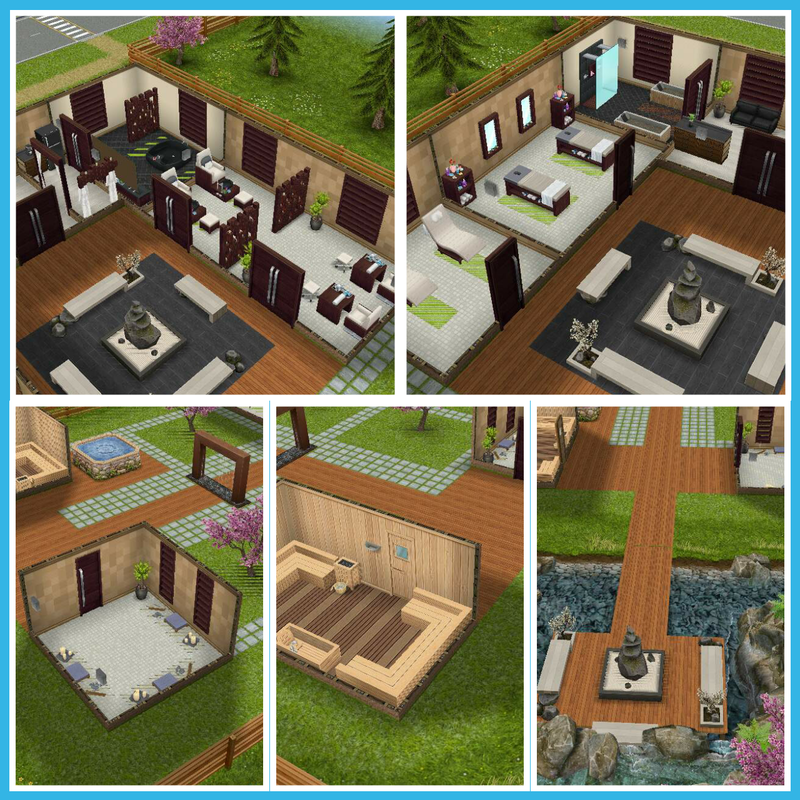 It has been so long since I first unlocked the spa template I cannot remember what else you unlock, I think there are some patio/balcony pavings too, if I manage to unlock it on my new game I will update this post, sorry about that! Not gonna lie, I’m pretty bummed / disappointed that the community prizes weren’t included. 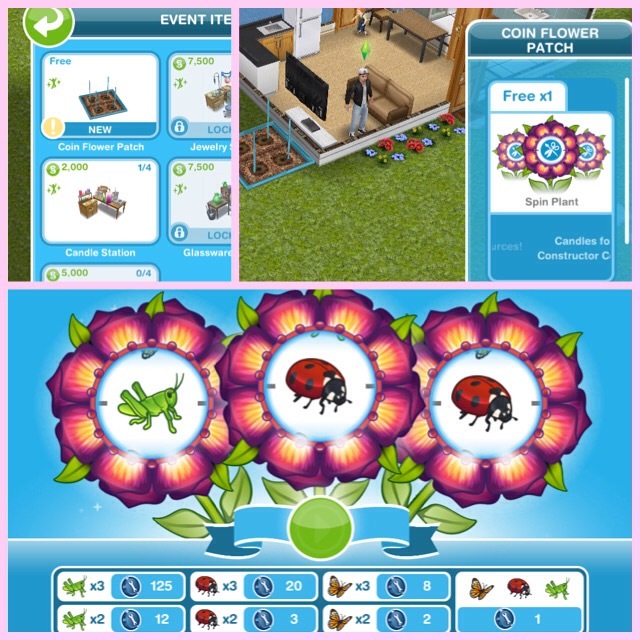 I’d played back when the first community event came out (didn’t have enough Sims to get the template), but I started a new game earlier this year and lost the community prizes that I’d won. 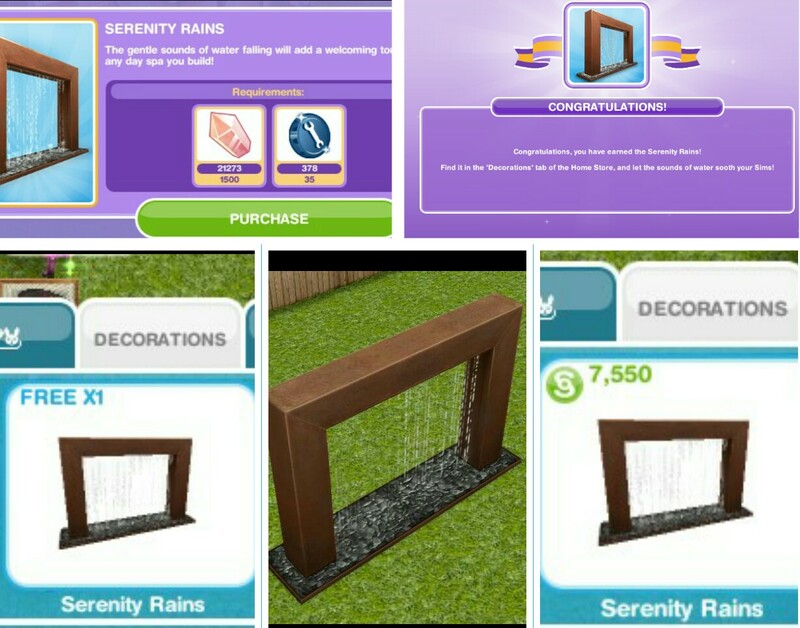 Will those come back in a Simtown Market event? I know it is a shame, let’s hope they return! 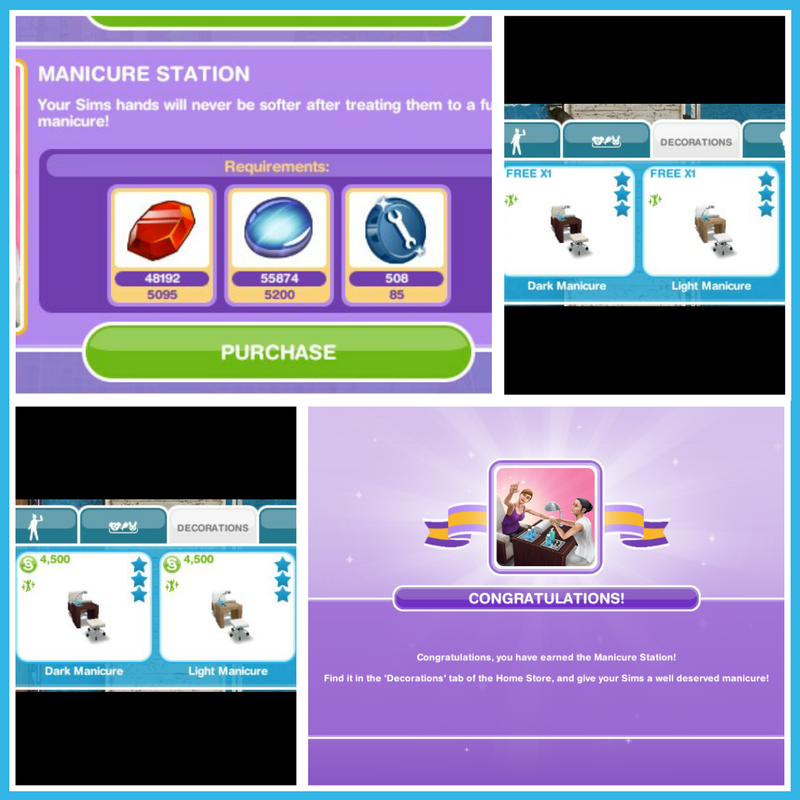 Hi, I wanna ask, a long time ago I bought manicure item (using real money) because I didn’t know there such an event to get the item. And now, when this event just start, it showing that I can’t unlock the manicure item. It’s showing I already unlock them. But the thing is, I can’t found it anywhere on home store or my inventory. Sometimes when you forgot to claim the free things on home store, is it just vanished? 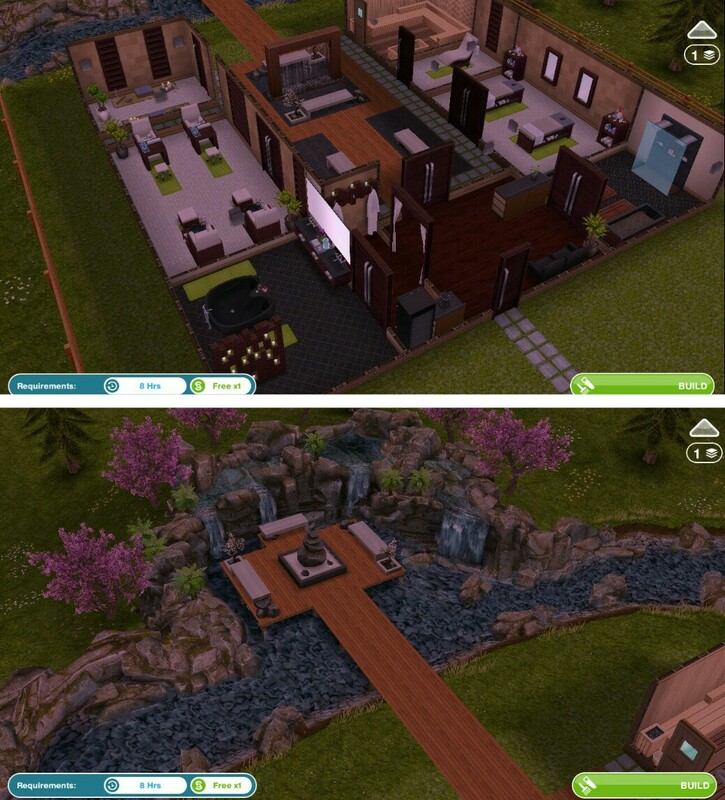 I had previously started the Spa event, so when it started again, I was started where I left off. Only problem is, it says I haven’t unlocked the pottery, glassware, or jewelry stations so I can not use them. The progress shows that I am all the way to the Sauna and Massage. So how am I suppose to unlock the crafting tables if I am already way past that? Help me please! I was so excited to have this event come back because I was so close to finishing it last time. Thank you for your answer, I`ll try to buy all the prizes and if I do, I’ll keep you updated. Nope! 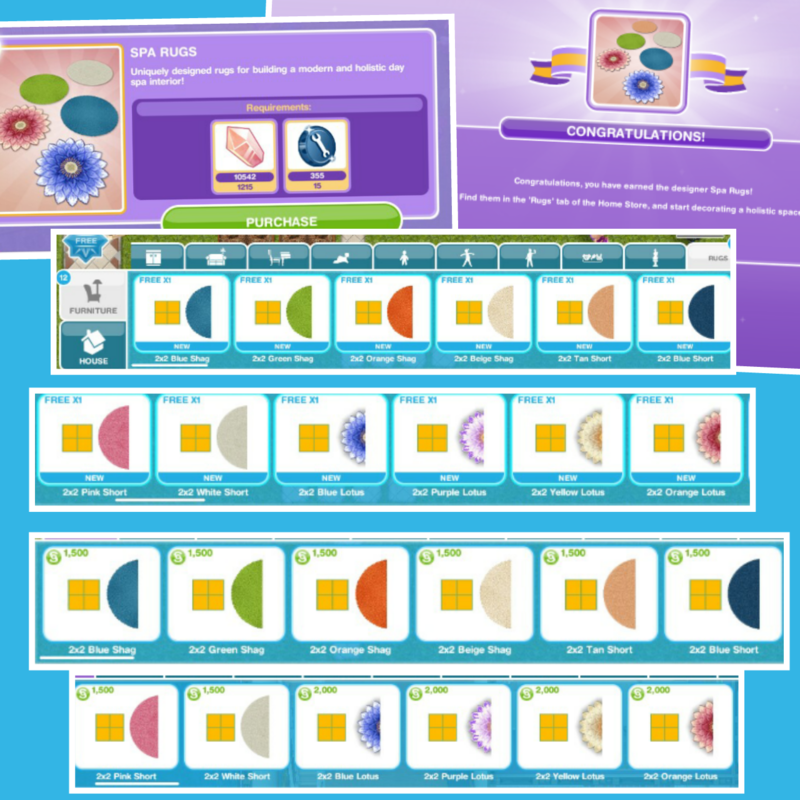 They didn’t give me this template for free… l bought all the prizes… so sad! Not fair! Oh that is really unfair! Sorry about that! Hey there! So I won the spa template in a rare box with keys but it was never free and now this event is here it says I have everything unlocked although I have never done this event before and it’s still not free! what should I do? They didn’t give it to me free either. That’s really not right😢 is there something I can do? When did the spa event start up again? My game is updated and I haven’t seen any events since the Halloween or backyard event. Did I miss it? I am going through this event for the second time. The progress bar shows that I should have access to all craft stations, but when I click on them it says they still need to be unlocked. Any ideas why this is happening?? I love your blog. It has helped me through many quests! 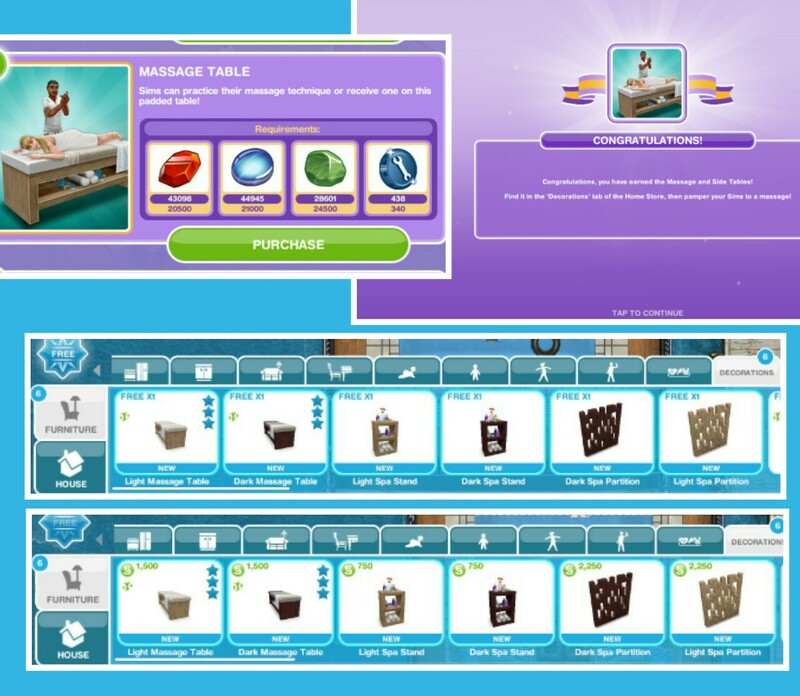 If you have unlocked those stations on the bar at the top of the progress tab then this is a glitch, unfortunately you will need to contact the makers to see if they can fix this for you, this post explains how to contact them if you are unsure: https://thegirlwhogames.blog/2016/05/29/the-sims-freeplay-contacting-ea-firemonkeys/ sorry I couldn’t be any help! Thanks! I guess a lot of other people are having this issue too! I contacted firemonkeys a few days ago, and haven’t heard anything since I got the automated response. I tried to find this answer on your posts but can’t seem to find it: I unlocked pottery and jewelry in the past events but it’s not letting me unlock them again, it just moved me forward to glassware which I just unlocked. But now I won’t be able to earn the other prizes unless I figure out how to reunlock them. Any tips? 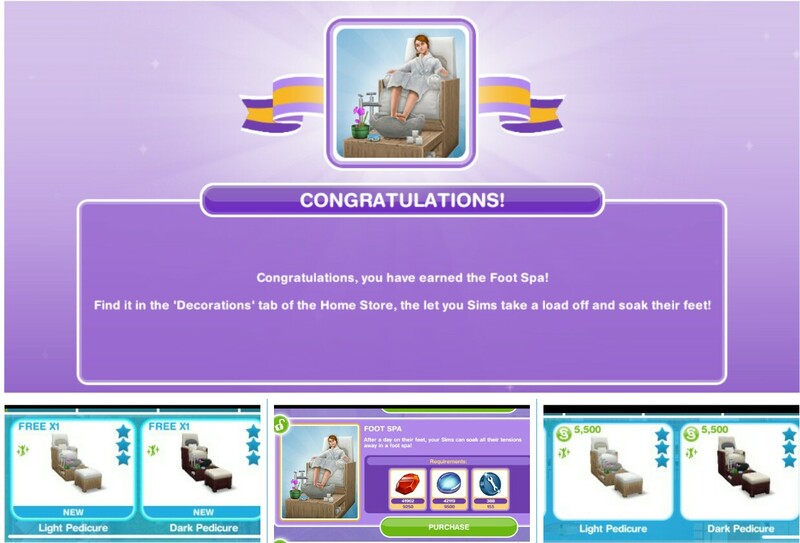 I am doing the spa event now and I have “unlocked” the jewlery and the pottery stations, but when I try to produce those things it tells me I have to wait until I unlock them. But I have unlocked them. So I can’t get anything that requires more than candles and glassware. Anyone have this problem? Heyy! I started the event the first time (with the stone deposits) and I started off where I ended last time. 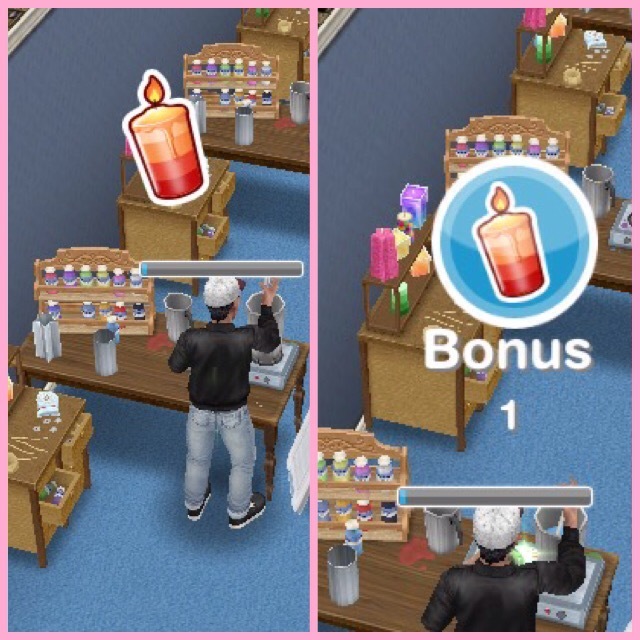 I was already past the manicure part, so I started off there again, but for some reason, I could only use the candle station. Is there anything I could do to solve this problem? Your blog is very helpful by the way! Helped me through many events and problems I’ve had! 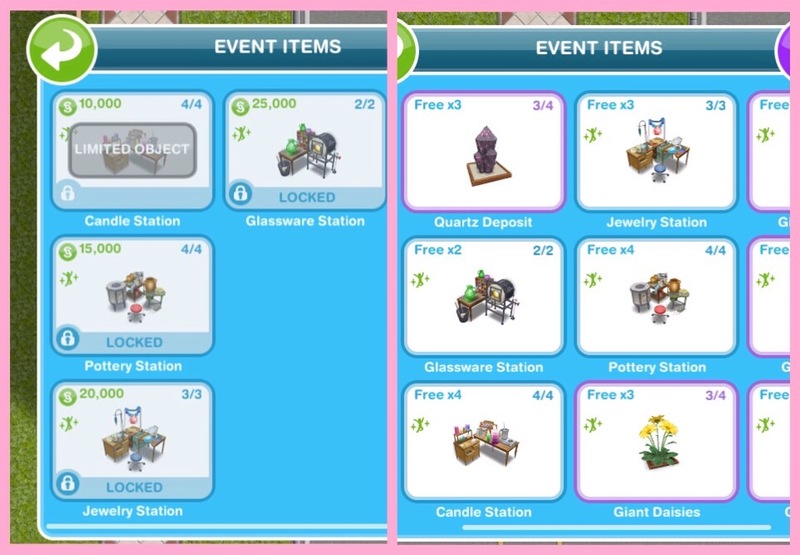 If you haven’t unlocked those stations on the bar at the top yet you will need to keep collecting the arts and craft items until you do but if you have unlocked those stations on the bar at the top of the progress tab then this is a glitch, unfortunately you will need to contact the makers to see if they can fix this for you, this post explains how to contact them if you are unsure: https://thegirlwhogames.blog/2016/05/29/the-sims-freeplay-contacting-ea-firemonkeys/ sorry I couldn’t be any help! That’s okay! Thank you so much!! 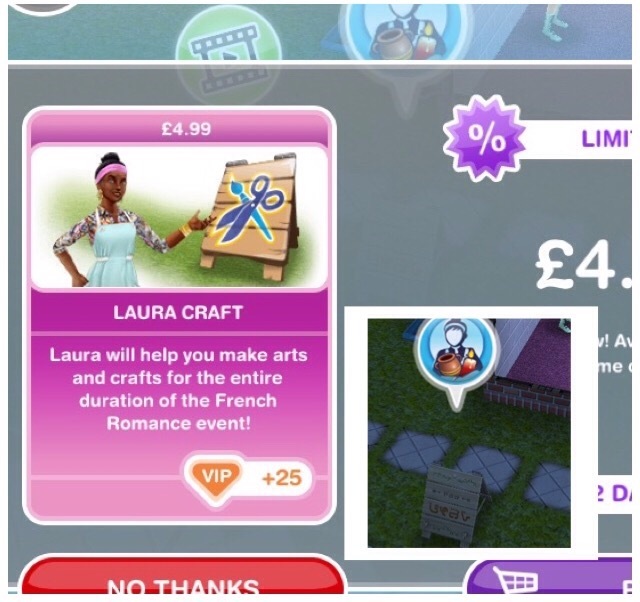 Hi, I did the spa event last time and it saved my progress, but the problem is it says I can’t use the pottery or jewellery station because I haven’t unlocked them, even though I have? This is annoying because I’m losing time and will miss out on unlocking more prizes. 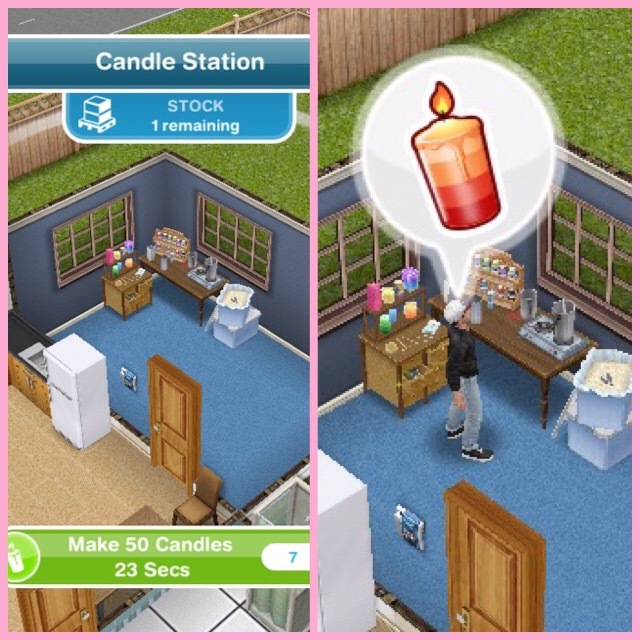 I can use the candle station and glassware because I just unlocked it. Help!? I noticed your post still indicates you get the items from decorations tab and the first one is free, for me this is not the case I have to get them from within the event and they just cost the items and constructor coins. Wondering if this is just me or if this is the new version of the event? I mean once you have unlocked them using your arts and craft items and coins the first one of each is free and it also says where you can find them in the store. 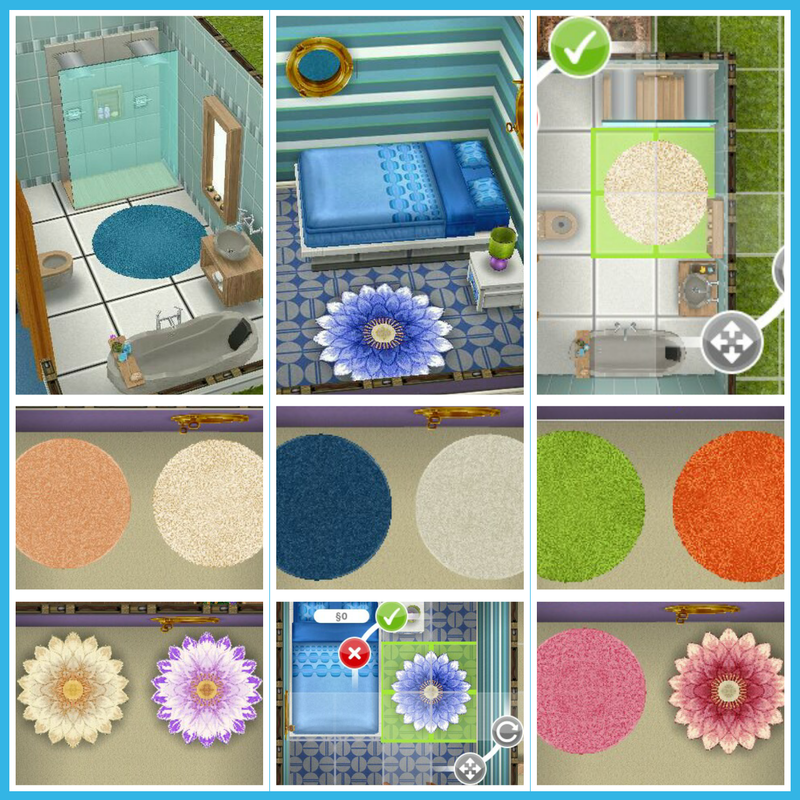 I’m new to Sims Free Play. Ultimately with this event I am wondering if the candles/pottery I have leftover will be accounted for when the event returns, or will they disappear for good? 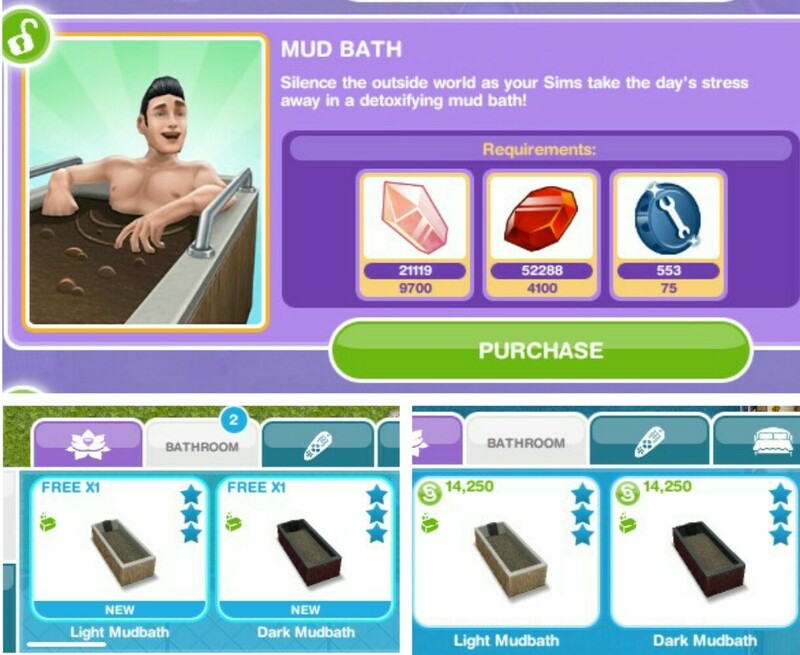 Did you win the spa in a mystery box before this event? If so you won’t get the spa free unfortunately.